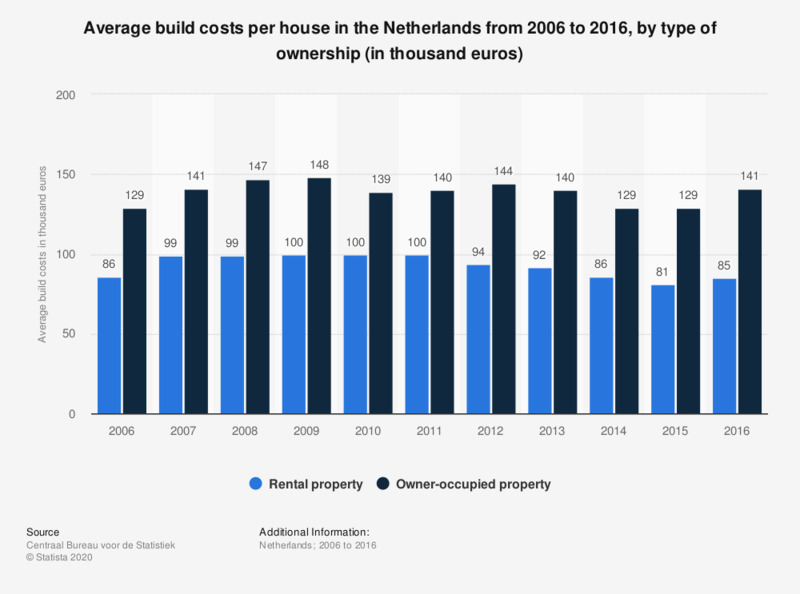 This statistic shows the average build costs per house in the Netherlands from 2006 to 2016, per type of ownership (in thousand euros). In 2009, the build costs of newly constructed owner-occupied residential property would amount to an average of 148,000 euros. The average build costs per house is a calculation of the total build costs divided by the total amount of houses for which a build permit was issued. The source assumes that the permits issued are for newly constructed residential property only. Excluded from these figures are build permits that allow for the construction of certain combinations of residential real estate, namely the construction of both rental and owner-occupied houses, residential real estate with other (commercial) buildings, residential units and recreational real estate.